Valerie: We are calling upon Cosmic Sai Baba with great Love and Respect to make his presence among us. It is the 5th of December 2017; and it is a Tuesday; and we are at Moss Vale. ❝I am here, and I am very pleased to be here and to see both of you and to know I am welcomed. Thank you for inviting me. I know your meeting is a little different today – it has had some inspiration from us for we wanted you to be together for this message as there is a new change coming for both of you. Nothing to worry about – one that you will rather enjoy. And so I would like you to know this. It is a reward for all the work that you have done. And yes there is need for adjustments within her (Mother Earth) because of all the different things that have been taken from her internally – she has to adjust – and that requires a shaking and sometimes a ‘shedding out’ for a healing. Mankind needs to recognise that nature is Mother Earth and she gives the breath that you breathe and holds the water that you drink and she grows the food in her earth which you eat … it is very much so (that) you are dependent upon her while you are here in an Earth Body to survive. You know of course you are spirit – you are spirit bodies – your spirit is first and foremost – it is what keeps your Earth Body alive. I have said this many times and I would like to see changes taking place upon this Earth to nurture her. If she wasn’t (alive) there would not be the energy to grow things or to hold things like water or to change the air or the ether into oxygen that you breathe – so please do not take it for granted. Do not take her for granted. She is your MOTHER – the Indigenous people around this Earth in Ancient times knew this very well, because they listened to what the star people taught them. They had different names for the star-people – they called them Gods and indeed they came with the Force-field of God that nourishes everything and takes care of everything. So do not doubt that at all. So Mother Earth is the closest you have to Love in that she is constantly caring for you and giving you a place to reside so that you can take the opportunity to live a life on the Planet Earth and experience different experiences of Life and Love – for that is why you are here. You are here to help one another and in helping one another you are growing – you are growing in consciousness and there are some people on Earth that have grown more than others but they are all helping one another. So choose the Wise Ones or the Ones who make you feel good when you are near them. Your friends – you will know them – and the others, send a prayer to them but avoid them! Because in some ways you magnetise the energy from them if you are not taking care of yourself and your own body. While this is important you are living in an Earth Body that has a consciousness also that is separate from the consciousness of your Self, your Soul your Spirit. So remember that. Be aware of all these things – do not take anything for granted – be grateful for what you have while you have it for you will go on eventually and you will still have a consciousness and a life. So with this message I will leave you this day for there is another that wants to come and speak – it was promised from the last meeting. And that is Andromeda Val from Andromeda. So I will take my leave and I understand that opportunity has been given to send letters to Valerie’s website and I will gladly receive them. As soon as you write them I have already received them – so be aware of that – there will not really be any need to send them but if it makes you feel good then please do. Message received from Andromeda Val at Cosmic Sai Baba meeting on 5th December, 2017 at Moss Vale. 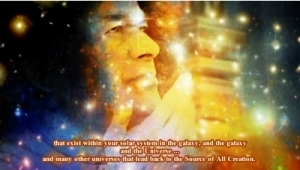 “I am Andromeda Val and I come this day with great pleasure at the invitation of Cosmic Sai Baba for He has arranged for this meeting to take place. I feel I have integrated with Valerie’s energy and so the messages should be clearer today. If they are not we will keep working at it until it is. If you remember she was speaking of the language or allowing me to speak through her – with a language that is used at Andromeda from the area from where we come. And, how can I say, the message was too fast – literally – so we hope to be able to pass it on more slowly this time. I have a lot of information I can give you about Andromeda but today I would like Valerie to receive a message in the Light Language from Andromeda. “We will come again, I promise, and we will again work with this energy to allow a language to take place. Thank you, thank you my children.